As the name implies, semi-tubular rivets have quite a bit in common with tubular rivets. The main difference is that semi-tubular rivets feature a partial hole located at the tip. The hole in the rivet makes it possible for the worker to utilize less effort in fastening the rivets, thus allowing for a more efficient and faster installation process. In order for the rivet to be fixed, the tubular part of the rivet only needs to be rolled outward. Thanks to the presence of the hole located at the tail of the part, semi tubular rivets can also be utilized as pivot points. Semi tubular rivets do not expand in a radial manner, which means that you do not need to worry about them interfering with movement. Semi-tubular rivets can be installed in kick presses, pneumatic squeezers, manual squeezers, and more. Available in a variety of different and sizes, semi tubular rivets are primarily used in lighting, brakes, binders, and other types of electronic and mechanical products. While semi-tubular rivets are available in various platings and finishes, the most common platings and materials for this type of part includes nickel, zinc, brass, and tin. Semi-tubular and tubular rivets do have quite a bit in common. With that said, semi-tubular are often considered to be superior to solid or tubular rivets. For instance, tubular rivets can only be used when it is possible to access both sides of the material. This means that it is not possible to use tubular rivets on closed structures. Tubular rivets also require massive amounts of force for proper installation. For this reason, tubular rivets are often required in situations in which safety is a necessity. 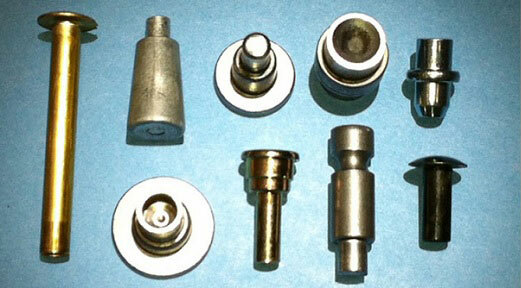 It is also possible to take advantage of a number of other advantages with semi-tubular rivets. For instance, semi-tubular rivets offer a cost-effective alternative to threaded fasteners. Additionally, there is practically no waste produced during the manufacturing process of semi-tubular rivets, producing even greater savings. The fact that these types of rivets can be easily adapted for automation process is also beneficial for many industries.